In July 2017, Overleaf and ShareLaTeX joined forces. We have brought the best features and technologies from Overleaf and ShareLaTeX together into a new platform and editor which we’ve called Overleaf v2. Overleaf v2 launched to everyone on 4 September 2018 as the default platform. The Overleaf v1 editor will remain available until 8th January 2019. What has Changed with Overleaf v2? From 8th January, 2019, all your projects will automatically move to Overleaf v2 the next time you open them. We have now moved millions of projects since the start of the Overleaf v2 beta in May 2018, and in most cases moving your project will take only a few seconds. We conducted surveys and analyzed a lot of data to try to bring you the best Overleaf v2 we could without taking forever to do it. This means that some Overleaf v1 features will be going away at least for a while. We apologise for any inconvenience this may cause, and please note that we hope to meet many of the same needs in new and improved ways in the future. The assignment tools for creating and collecting homework assignments will no longer be supported. Your assignment templates and assignments will become regular projects in Overleaf v2. You can of course still download your files and submit them using another system. Please see this help article for more information about teaching in Overleaf v2. Files imported from CiteULike and Plotly will become ordinary files when you move your project into Overleaf v2. You can still use these services, of course, but you'll need to download and upload the data manually or use the more general 'link to URL' feature. Publishing directly to Figshare and Peerwith is no longer supported, but you can always download your files and submit them manually. If you link your account with IEEE Collabratec®, you will still be able to manage your library from Collabratec, but the icons on the Overleaf projects page for linking and unlinking projects from your library will no longer be available in Overleaf v2, initially. You will also now need to use the built-in Share menu in Overleaf v2 to share your projects with members of private/research groups. It is still possible to submit new articles directly from Overleaf to F1000Research and Wellcome Open Research, however the editorial team will use the new Track Changes system, rather than the previous system of comparing Overleaf versions. If you are submitting revisions or an update for a published article, please contact the editorial team directly before proceeding further. If you have received an invitation to collaborate on a Protected Project in Overleaf v1 and have not accepted it before 8th January 2019, you will need to request another invitation to the project in Overleaf v2. If you have been sent an email confirmation message and have not confirmed your account before 8th January 2019, you will need to send yourself a new confirmation message. You can do this from your settings. The v2 dash will not show the Last Edited By column for now. We are working hard to bring this back. You will still be able to see when a project was last edited, and you can, as a workaround, still find out who made the last edit using the project history system. The pythontex package is not currently supported on Overleaf v2. This is because of a change to the security model in Overleaf v2. We will investigate whether we can bring it back. The longest compile timeout supported in Overleaf v2 is 5 minutes. If you have trouble with timeouts in Overleaf v2, please check our help guide for debugging compile timeouts or contact our support team if you are stuck on a compile timeout. Git Access: Access via git is now out of beta. You can now move projects to Overleaf v2 and still access them via git. You will, however, need to update your git remotes by following the instructions that you receive on your first push / pull after moving the project to Overleaf v2. For extra security, the git link now corresponds to the project ID rather than the sharing URL. To view this, open the git modal in the main project menu. Please note that anonymous edits are no longer allowed via git bridge, so even for projects with link sharing enabled it's necessary to sign in on the git bridge with your Overleaf registered email address ('username') and password. Renaming Projects: Overleaf v2 won't try to infer the title of your project from your \title command — you should instead either (a) on your projects page, click the checkbox next to your project, and then go up to More in the top right, to find the option to rename, or (b) open your project and click the pencil icon next to the title in the top bar. Finding Position in Source / PDF (SyncTeX): This is still supported in v2. You can either click the two arrows on the divider between the source and the PDF, or you can double click the preview to find the corresponding location in the source. Dark and Light Themes: If you prefer a light theme, you can change this setting by opening a project, opening the menu (top left), and changing the Overall Theme setting. What has happened to ShareLaTeX? The ShareLaTeX editor is at the core of Overleaf v2, on top of the Overleaf ecosystem. The first time you log-in to ShareLaTeX after the 4th September, your account will be transferred to Overleaf v2. You can find out more details of the changes that were made on September 4th in the launch announcement blog post. 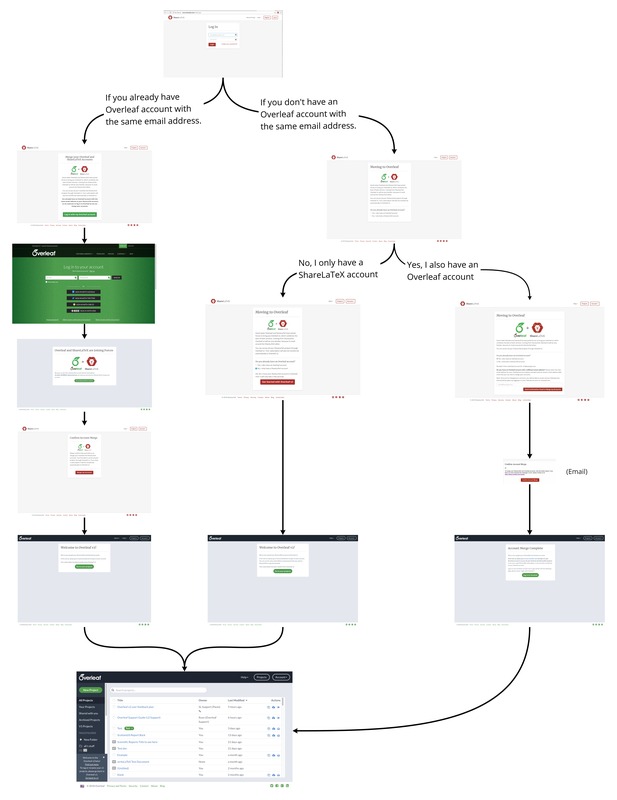 If you'd like to know more about how you can move your ShareLaTeX account to Overleaf v2 after September 4th, we've prepared a handy flowchart that covers the possible steps, starting from when you first log in to ShareLaTeX after the launch on 4 September 2018. Yes. Your data will never be deleted, locked behind a paywall, or hidden from you. Both Overleaf and ShareLaTeX have always put users and their data first, and will continue to do so as part of Overleaf v2. If you are having difficulties finding any of your projects, please get in touch with our support team, and we will ensure you have access to everything you have created on either site. Note: if your Overleaf v1 and ShareLaTeX accounts were not linked when you first logged in on Overleaf v2, we can still relink them. Write to our support team to get started with the relinking process. Overleaf v2 supports both Overleaf v1 and ShareLaTeX premium accounts, so you will not lose access to any paid features from either platform. We assure you that your premium account in Overleaf v2 will have the equivalent or better features than what you have today. You will not need to make any changes to your account — we will provide you with information if any premium account changes occur. Yes. Your account will continue to run exactly as it does now whilst we work on the combined service. We will be in touch with you to offer the opportunity to discuss any questions you may have, and you’ll be consulted for feedback and input as we develop the combined service. Please feel free to contact us at any time with questions, or to ask for an update. Yes. Both Overleaf and ShareLaTeX are committed to ensuring that all of the open ShareLaTeX codebase will remain open source and will continue to be actively developed. Overleaf v2 is built on the same open source code as ShareLaTeX and will also be open source. Yes. Server Pro will continue to be a core product, with all of the best features of both platforms going forward. Please get in touch with our support team at support@overleaf.com.